What do you call it when two cookies from the same sheet fall in love? A batch made in heaven! Camera for Clear Choice Photo Booth! 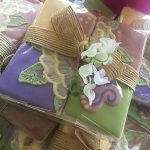 Thank you favors for your guests sweet enough to eat. So let’s talk kiddies at the wedding, how are you planning to keep them occupied during the reception? I’ll bet cookie decorating kits didn’t cross your mind, but they’re pretty genius right? 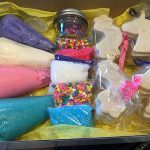 Sarah from Custom Cookies by Sarah M visited us this week and she told us all about how you can incorporate cookies into your wedding, and cookie kits were just one of a million things you can pick and chews. Edible cookie box for the proposal. What’s sweeter than popping the question? Enjoying your first moments as an engaged couple with a one of a kind cookie-built ring box! “Proposing” to your bridal party with cookies. Your “I Do” Crew can’t say no with this delicious way of letting them know you want them to stand by you while you tie the knot. Give your guests a sneak peek at The Dress. This is especially fun for Bridal Showers! Cookies can be made as an exact replica of your dress right down to the smallest detail, an adorable way to bake your guests’ day a little cuter. Welcoming your out of town guests. Even better, theming them to the city where your wedding is taking place. Cleveland Rock and Roll Hall of Fame cookies? Yes, please. Palm tree shaped cookies for a beach destination wedding? Your guests will feel appreciated, and will love a pick-me-up after their long trip. Save the Dates and Invites. 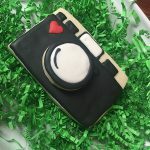 I mean, yeah, they’ll need to take a photo to keep the information before devouring but, with cookies that cute of course they’re already Instagramming the creativity of a cookie as an invitation. Decorate your own cookie kit. These are brilliant! Your smallest guests will love getting to stretch their own creativity at the reception and their parents will know you’re one smart cookie. How about cookie dolls? Same concept, but sweeter! This can also be used to add a little sugar to asking your flower girl to join in on your special day. 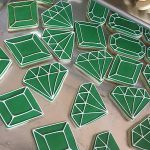 You’ve seen cookies as wedding favors, but we bet you haven’t seen cookies step up their game in this way. With the recent improvements in technology Sarah says, “You can make anything into a cookie.” Custom shapes to capture the way the met your fiancé. Metallic icing that perfectly matches your wedding colors (we see you, rose gold.) Hand-painted watercolor decorations. 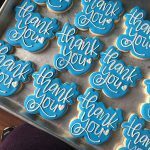 Cookies have never been prettier as wedding favors. Speaking of favors, why not put them to work? There’s nothing better than a guest finding their seating than with a handmade cookie spelling out their name. So remember when Sarah said anything can me made into a cookie? She wasn’t exaggerating. For example, if succulents are in your floral theme they can absolutely be made into an edible center piece your guests will be talking about for weeks. Or a December wedding can be complimented in a 3D winter scene complete with sugary snow. No, you read that right. Actual cookie flowers! They’re beautiful, they’re hand painted, and completely unique! And who else can say they got to eat their bouquet after their wedding? As you can tell, Sarah’s creativity when it comes to including cookies in your big day is endless. Her advice to brides is to never be afraid to ask for something out of the box, or something you’ve never seen. If you can dream it, she can find a way to make it happen. 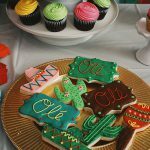 Not only will your cookies look absolutely stunning, your guests will rave about how delicious they are. Sarah does all of the decorating completely by hand herself out of her bakery in Akron. This post is part of a series highlighting wedding vendors. We believe wedding planning should be fun rather than overwhelming, so we’re inviting our favorite wedding partners to help you through the process! You can find more wedding vendor highlights HERE!